Humans start getting ready to die as soon as they are born. But for some, that process takes a whole lot longer than it does for everyone else. Take Italy’s Emma Morano. She was officially the world’s best live-r before passing away at 117 on Saturday, according to The Chicago Tribune. She was born on November 29, 1899—Guinness World Records says that would have made her the last known person born in the 19th century. What do you do to live to be that old? You do nothing. It just happens. Then you die anyway. “In the world of aging sciences, if you want to live a long life, choose long-lived parents,” S. Jay Olshansky, Professor in the School of Public Health at the University of Illinois at Chicago, told Gizmodo. “That’s always rule number one.” Olshansky, a human longevity expert, walked us through how aging really works. As a courtesy, newspapers always ask the oldest living person what their secret is. Morano said she ended an abusive marriage and ate raw eggs and cookies. 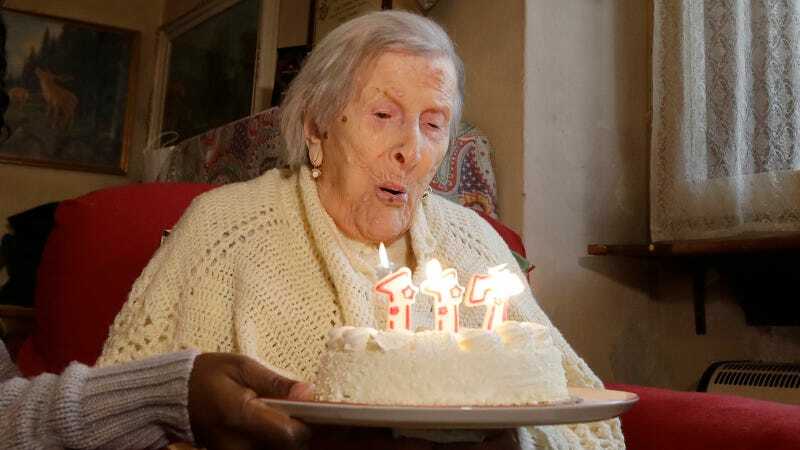 Jeanne Louise Calment used to be the oldest person ever and lived to 122; she ate two pounds of chocolate per week and quit smoking at 119. That’s nice, but those lifestyle choices—where they lived and what they ate —probably didn’t do much. Lifestyle is far from the whole story when it comes to your lifespan. There are a lot more people alive today compared with when Morano was born, so there will naturally be a lot more centenarians in the future. The world population has increased over 4 times since 1900, and the infant mortality rate has dropped a whole lot, from 100 babies per 1000 in 1900 to around 7 per 1000 births in 1999, according to the Centers for Disease Control and Prevention. We’re treating diseases better, and our geriatric care is adding years onto people who may have died at 90, said Olshansky. As far as how the centenarians get to live so long, Olshansky believes their biological clocks simply tick slower (and that those of women tick slower than those of men). The visible aging processes and physiological signs like cell division might happen at a slower rate, possibly due to genetic factors—he pointed out that really old folks generally look younger throughout their life. But this is something that lots of folks around the world are still researching. So, you will die, the decisions you’re making are probably making your life shorter, you probably won’t live to be 100, and if you do, it’s not because you drank red wine, snorted antioxidants or bathed in coconut oil. You got lucky. Chaos reigns.